With a Double Sideshifter you can use your lift truck to move two pallets of product side-by-side instead of one pallet. The Cascade Double Sideshifter gives your driver the ability to pick loads that are separated, bring them together, sideshift both loads and spread the loads. Full 27" pallet spread allows you to spread pallets against the outer trailer walls without excessive carriage widths. With the 72" unit, two 32" pallets may be spread to the outer walls of a 102" trailer. Excellent driver visibility is achieved by design of the false carriage, sideshifters and backrests. This design gives drivers the best possible visibility over and through the structure. 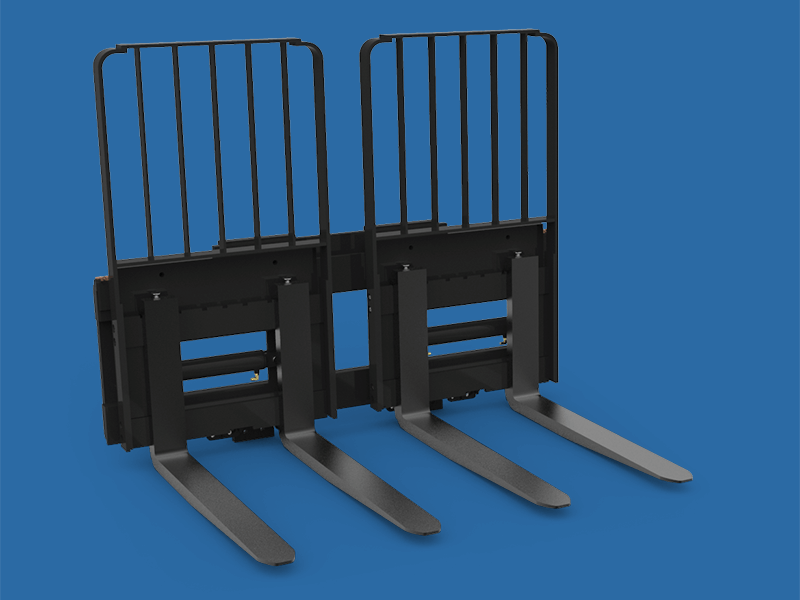 Mounts on standard 36" truck carriage without welding or modifications. This feature saves the added costs of purchasing and servicing extended width truck carriages. Heavy-duty load backrests are engineered for typical doublewide industrial applications with demanding durability requirements. The vertical bar, double plate design provides both strength and visibility.